Only one special per wedding! Not valid on previously booked events or custom packages. Please click on the below photos to see full package details and pricing. Our myriad of All-Inclusive Las Vegas Wedding Ceremony and Reception Packages will ensure your special day will be one you remember forever. 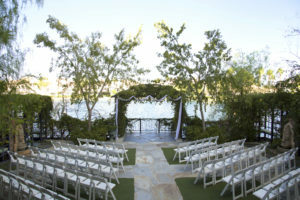 We offer a variety of indoor and outdoor weddings in Las Vegas ranging in prices from $2,250-$9,995. With the average wedding in the United States now topping $30,000, many couples believe piling on thousands of dollars of debt is the only way they can have their true dream wedding. At Always & Forever Weddings and Receptions you can say, “I do” in one of our award-winning locations then party the night away celebrating with family and friends. You’ll find no cheap/cheesy Elvis impersonators here. 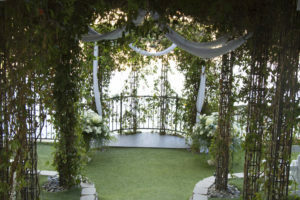 Our clients can choose from some of the most awe-inspiring wedding venues in Las Vegas to have their storybook wedding. Imagine exchanging your nuptials underneath an ivy-laced gazebo overlooking a tranquil lake, followed by a reception in our award-winning reception venue with 360-degree views of the lake. 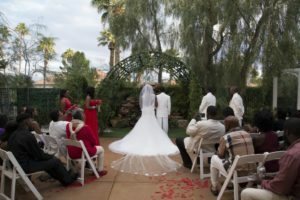 In addition to our gorgeous locations, our Las Vegas wedding and receptions packages include many amenities other companies make you pay for including a professional photographer, food, flowers, limo, wedding cake, and more. We have packages for intimate and large weddings and receptions at several price points that can be conducted 7-days a week. Our highly trained wedding consultants will work closely with you before and during the ceremony to ensure your special day turns out the way you want it to. To take a look at one of our many cheap Las Vegas wedding reception packages, click here. To book one of our Las Vegas wedding and reception packages select your options online using our Online Booking Engine or speak with one of our friendly wedding consultants. Make your dream Las Vegas wedding and reception a reality today.